Not only is Downtown Raleigh a great place for families to live, it’s also a great place for red-tailed hawks to make their home. We learned about these feathered neighbors at the Downtown Lunch Break Hawk Walk sponsored by the North Carolina Museum of Natural Sciences. There’s a pair of hawks nesting near the steeple of the First Baptist Church on Salisbury Street, directly across from the Capitol. According to a bird expert from the museum, these hawks nested in the same spot in 2011 and raised twice the usual number of young. While the number of hatchlings in the nest this year is yet to be determined, the pair have adapted well to urban living and raised four in 2011. The food is plentiful and there’s no real competition for it. The grounds of the Capitol grounds seem to be a squirrel haven, plus the red-tail hawks also like to feed on pigeons, starlings, and rats. So bring your binoculars and to get a good look at this particular pair of hawks and their nest. (And they’re not the only ones living in downtown.) 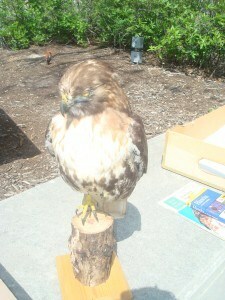 Join in on one of the museum’s hawk walks this spring. I’m really hoping these hawks make a big dent in the squirrel population in Downtown Raleigh, thereby protecting my tomato crop from those crafty little pests.